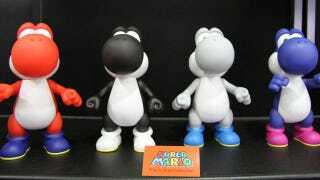 This line of Yoshis are just a fraction of the population of Nintendo toys and figures at Toy Fair 2011. These guys are from Global Holdings, a company that gets Nintendo items onto the shelves of Toys R Us, Wal-Mart, GameStop and other shops. A video tour of all the vinyl and plush Nintendo stuff that you can handle, all from Global Holdings. The people at PBM and First 4 Figures debuted this Mario DS holder here at Toy Fair 2011 in New York City. A company rep said the statue had just been approved by Nintendo's Japan office a couple of weeks ago. He boasted that Mario's grip can handle the new 3DS. This Mario will be out this year. This is Dark Link from Zelda. First 4 Figures has shown him before, but I thought you might like another look. He'll be out this year. These are Gachka balls, which each contain figures from one of several Mario or Zelda games (and some Sonic, as you can see). Most of what I showcase in the video is not out yet.